Manufacturer of high-efficiency boilers, Baxi, has received its first delivery of 80 Transporter vans from Volkswagen Commercial Vehicles. Established in 1866, the UK based company is a leading manufacturer of boilers, smart controls and low carbon technologies. The team at Baxi pride themselves on providing industry-leading customer support. 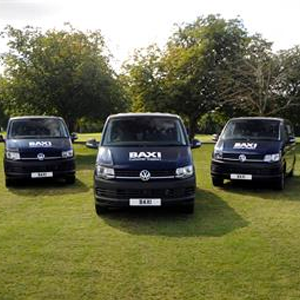 The fleet of highly advanced Volkswagen Transporter vans will be used by Baxi’s team of Customer Support engineers attending call-outs to homeowners across the country. The vans come equipped with multiple health and safety features, including five different braking assistants and a driver alert system which warns the driver to take a break if it detects fatigue. The practicality of the vans makes them an ideal choice for a business like Baxi. The new vehicles are slightly smaller in width and height than their previous Crafter vans, meaning they comply with new city-wide height restrictions, but are still able to hold the same load. The more compact design will also make it quicker and easier for engineers to park when attending customer visits. Louise Murton, National Service Operations Manager at Baxi, commented: “Not only are these new vans the perfect solution for our Baxi Customer Support engineers out on the road, but with a 33 per cent cut in emissions compared to our previous vehicles, they benefit the environment too.